The Pentagon said its proposed budget unveiled Tuesday would boost space funding by 17 percent over this year with money to stand up President Donald Trump’s Space Force and purchase new launch services. The total $14.1 billion in spending on space includes $72 million for the Space Force headquarters, which could be the first new military branch since 1947 if the president’s plan is approved by Congress, as well as money to stand up a U.S. Space Command and Space Development Agency. Funding for a slew of military weapons programs in the president’s $750 billion total defense budget also signal wins for General Dynamics Corp. and Boeing Co. But the request and the space service face an uncertain future on Capitol Hill, where Democrats see the administration’s cuts and use of an overseas war fund to skirt spending caps on defense as non-starters. The increase in space spending and plans for a Space Force come as the U.S. realigns its space strategy to compete with Russia and China, which are investing in new technologies targeting military and commercial assets in orbit during war, according to a recent report by the Defense Intelligence Agency. The Pentagon shared its legislative plan for creating a Space Force within the Air Force with Congress earlier this month and the president’s budget makes a formal request for the funding. The budget unveiled Tuesday also includes $84 million for the creation of the U.S. Space Command, which would oversee operational forces, and $150 million for a Space Development Agency, which could handle procurement and foster new technology. The budget would provide the resources needed to enhance U.S.. capabilities in space and stand up the Space Command, said a senior administration official, who briefed reporters on the plan on background before the official release.The official said most of money would be spent to bolster advanced communications capabilities , position navigation and timing, and space launch. The Air Force is also planning $1.7 billion for four launch services as part of its National Security Space Launch program as well as the purchase of its first GPS III follow-on satellite after a contract with Lockheed Martin Corp. for the satellites in September, according to defense budget documents. 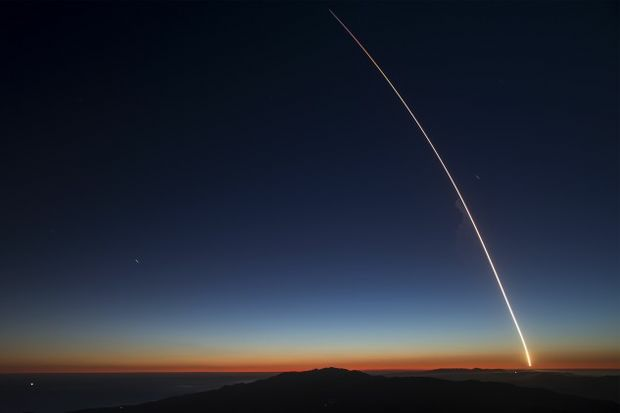 There is a growing consensus among lawmakers that the military needs to improve space operations but critics worry a new service could create unneeded bureaucracy. Questions over the space plans are likely when Air Force Secretary Heather Wilson is expected to testify Wednesday to a Senate Appropriations subcommittee about the budget request. Air Force officials will also testify Thursday to a House Armed Services subcommittee. The Pentagon will also face questions over its other spending during Capitol Hill hearings as lawmakers create a budget plan and appropriators decide on specific funding. Rep. Mac Thornberry (R-Texas), the top Republican on the House Armed Services Committee, said $750 billion for national defense programs is the right number for fiscal year 2020. He criticized the structure of the Pentagon’s budget request, which offloads much of its discretionary spending onto the overseas contingency war-fighting account, which is not subject to spending limits. Thornberry told reporters Tuesday he wants negotiations to start to strike a budget deal for fiscal years 2020 and 2021 and suggested the possibility of attaching such a deal to debt limit negotiations that have to take place this year. The White House’s Office of Management and Budget made itself “less relevant” by building the 2020 budget plan that way it did, Thornberry said. Northrop Grumman Corp.’s B-21 bomber would receive $3 billion under the Pentagon’s budget plan, while another important leg of the nuclear triad—the new Columbia-class submarine made by General Dynamics Corp and Huntington Ingalls Industries Inc.—would need $2.2 billion in fiscal 2020. The new submarine has steadfast congressional support with backing from the Connecticut, Virginia, Rhode Island, and Maine delegations. General Dynamics would also win with another congressional favorite—the Army’s Abrams main battle tank—which under the Pentagon plan would be funded at $2.2 billion for modifications. Oshkosh Corp. would see $1.6 billion for 4,090 Joint Light Tactical Vehicles. Meanwhile, the Navy plans to invest $447 million for a new project to build two unmanned surface ships for which a design contract could be awarded at the beginning of fiscal 2020. The Navy’s plan is to buy 10 of these vessels at a rate of two per year over the next five years. The new guided missile frigate program is counting on $1.3 billion for the first ship in the class. The Navy plans to buy nine new frigates over the next five years. Boeing Co. comes out successful from the Pentagon’s budget planning. Apart from $1.1 billion for eight new F-15X fighter aircraft for the Air Force, the Navy is requesting $2 billion to buy 24 Super Hornets—another congressional darling made in St. Louis. The Army is planning on 48 AH-64 E Apache attack helicopters for $1 billion. The helicopter is also made by Boeing. Sikorsky, now a unit of Lockheed Martin Corp., would see $800 million for six VH-92 presidential helicopters. The Pentagon plans to invest $10.4 billion in hypersonics research and development with $2.6 billion in fiscal 2020.